How To Get Out of Debt and Stay That Way! “Max” is a friend of mine (I don’t like to “out” friends on this site, so I’m being pretty careful about what I say here and a few specifics may be blurred). He’s had a significant number of challenges in his life, including a few minor criminal indiscretions related to drug use in his early adulthood, but now he’s raising two kids on his own and trying very hard to make it. One of Max’s biggest challenges is simply getting his financial life straight. Because of his background, he has a very hard time finding work beyond minimum wage – employers won’t trust him with more complex work, even if he’s up to the task. As a result of that and also of having two young kids at home (as well as a long history of debt and poor credit), he’s often riding the fine line of having enough money to make it through a month, even with some state assistance – and sometimes he falls short. Falling short when you have no credit to help you get through can be extremely painful. In Max’s case, his bank usually covers relatively small checks but sticks him with an overdraft fee – somewhere around $20 for each one. If it’s a larger check that happens to exceed his balance, the bank will reject it and charge him an insufficient funds fee – around $10 – plus the place to which he wrote the check will charge him a bounced check fee, ranging anywhere from $10 to $75. 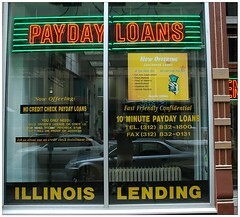 Luckily, Max realized from day one that payday loans are a poor idea, but many people in Max’s situation sometimes turn to such loans. They’re bad news – avoid them at all costs. The interest rates charged there are absurd. Such fees are not things that Max can easily afford in his budget. Quite often, then, one bounced check will cause a ripple into the next month, triggering another overdraft. In the end, Max is caught in a vicious cycle that can be really difficult to escape from. Here are ten ways that Max can start turning things around. 1. Keep a careful account register. Whenever you write a check for any reason, make an ATM withdrawal for any reason, deposit any money, or pay any bills online, record that in your register immediately, and update your balance as you go. Not only will this help you keep an accurate balance on your account, it will also force you to keep more in touch with your spending. Your account register becomes something of a spending diary, making you take a deeper look at what you’re really spending, subtly pushing you to tighten down the screws. 2. Learn how to use online banking. Online banking is incredibly useful. It gives you access to your account balance and recent bank transactions at your fingertips, and if you have online bill pay, it also gives you the capacity to handle many of your bills right there at the computer – no stamps, no checks to write out, no envelopes to address. This not only saves a bit of money, but lets you handle all of the math right there, ensuring that you have enough to cover the bills you’re paying. 3. Keep a careful eye on your account balance. The first two ideas lead straight into the third: keep an extremely careful eye on your account balance. Don’t trust what you “think” is in your account; know what’s in your account. Keep a ledger. Use your online banking to check it. Call your bank if you’re not sure about something. Knowing what you actually have in your account – and knowing that it’s a line you simply can’t cross – is vital. 4. If you’re afraid of overdrafting, contact the group you need to pay, explain the situation, and pay late if you have to. Don’t put the cart before the horse. Quite often, people are so worried about being late on their bills that they pay the bill without being sure that the money is in their account to cover it. Then, when the check bounces or the overdraft fee is charged, it ends up being much more than the late fee on their bill (usually just a few bucks). If you don’t think you can cover a bill, call that company and ask about the late fees. Explain your situation and ask for that late fee to be waived. You’d be surprised how often that fee will get waived if you just ask. If you’re still having problems, ask for help. Tap your family first. Don’t ask for money – just ask for some help getting your finances straight. Allow someone you trust and respect to go through your finances and help you come up with a plan to fix the problem. Don’t ask for loans, though – loans between friends and family members rarely end well. Just tap the common sense advice of someone you know, trust, and respect. If you know and trust and respect someone, they’re quite often glad to help you. There’s really no better time to be ultra-frugal than when you’re trying to escape a vicious cycle of overdrafts, bounced checks, and payday loans. Have a period of lean living while you get through this – stop your cable service, get rid of your cell phone (if you need one, get a prepaid one and strictly limit your use), eat at home (and eat simple meals), kick your vices (smoking, drinking, drug use, lottery tickets, gambling), and don’t go out on the town. When you’re in a vicious cycle like this, every dollar you spend will cost you two or three more in the very near future, so hold onto every penny for several months until you start to get a bit of breathing room. 7. Don’t let windfalls fall through your fingers. If you come into some cash all of a sudden, don’t celebrate and spend the money frivolously. It’s great to feel good about your windfall, but take that money and put it in the bank, giving you some breathing room against overdrafts. If you go spend it for fun, you’ll be right back where you were before, scraping to make ends meet and losing a lot of cash each month to the bank and other businesses paying fees and interest rates that are simply a waste of your money. Blowing it might give you a little rush right now, but the constant pain of paying those fees over and over and never feeling like you’re getting ahead will add up to much, much worse. 8. When you start to get ahead, make a deposit but don’t record it on your register. One effective way to use your windfall is to simply put much of it in your checking account, but don’t record it on your register as a deposit. Instead, you have a buffer in there now, so that if you silp up and go below $0 on your ledger, you’re not actually overdrafting your account. The pain of the overdraft and bounced check fees go away because of that buffer. Another tactic? If you see a healthy balance building up in your ledger, write yourself a check and record it, but don’t cash it. Tear up that check. The amount of that check has become your buffer. 9. Start establishing an emergency fund to deal with unexpected expenses. If you start going for months without these fees, you’ll start to see yourself getting financially ahead. Don’t let that be an excuse to slack off. Instead, start putting some money aside each week (or month) into a savings account so that when a real emergency occurs – you lose your job, your car breaks down, etc. – you have the cash to do it. If you used to be spending $30 a month on overdraft fees or payday loan interest, there’s your $30 a month to start building an emergency fund. Give it a couple of years and you’ll have $750 in that emergency fund – enough to handle a car repair or a week without work without skipping a beat. That’ll take a real load off your shoulders. 10. Work to establish positive credit for yourself. Once you’ve begun to escape the routine, the next strong step you can take for yourself is to turn around your credit. Likely, if you are leaving behind a pattern of missed and late payments and lots of bounced checks, you have a poor credit history. Now’s the time to turn that ship around. Pay all your bills on time. Get a little credit and use it effectively. Here’s a great guide on building your credit up that I wrote recently. Will Max use this information to his advantage? I certainly hope he will, but the change he needs is up to him. Fortunately, I think he has enough character to make it happen.